Paris is a fashion capital ! Shopping is a must do during your stay !!! Merci is considered the most trendy concept store. Why? It has an incredible variety of unique goods from interior design to fashion, and a great selection of French brands. It is the place you want to go to if you like trendy and designer items. Zadig & Voltaire got its name inspired by the novel “Zadig ou la Destinée” written by Voltaire, one of the Lumières philosophers. So French and so Parisian ! Quoting Voltaire, “the most important decision you make is to be in a good mood”, and I believe shopping at Zadig & Voltaire will put you in a good mood. From revisited chic basics to colorful and cheerful dresses and skirts, any woman will find what they desire. It is one of the ultimate brand of Parisian women and it fully deserves . 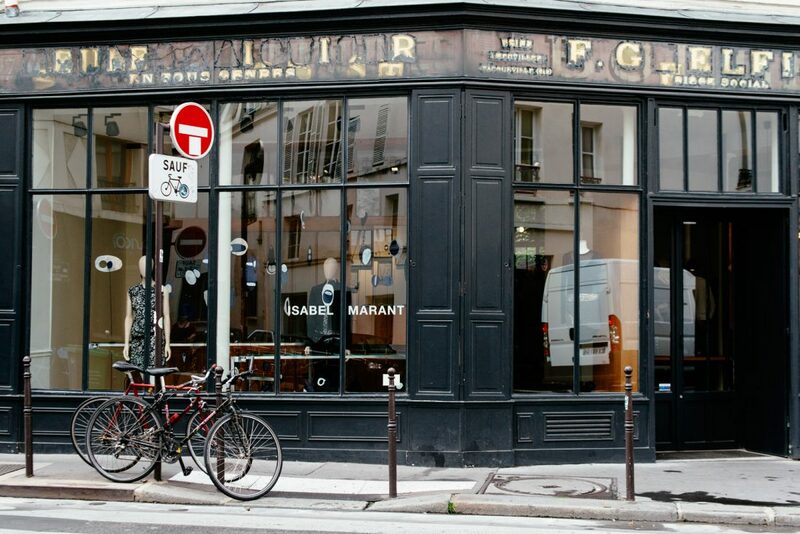 French superstar designer Isabel Marant has one of her many Parisian shops in the house on the other side of the streets. Who’s a Parisian fashionista now ? .The Central Department Store: Le BHV Marais. Le BHV Marais is one of the oldest department store of Paris. Also one of the most famous. Created in 1856, it is one of the favorite shops of local Parisians. .Rue de Marseille 75010 – Fashion outlets. Shopping in Paris can be way too expensive ! Do not panic, it is still possible to indulge and afford ultra-broken fashion pieces of its favorite brands. While these are items from the previous season, the good deals are there. The best brand to feel like a Parisian ! live in Paris with the most stylish, effortless and chic clothing line to debut stateside. This brand is mostly sold online https://www.sezane.com/fr with small collections and has opened a store in Paris imagined like a Parisian apartment ! Leon & Harper is my Favorite brand ! it offers cool & chic outfit with lot of color and fun quote! highly recommend! you will find everything: clothes, jewelry, accessories, decor, But especially at all prices and with a selection always more precise (charlotte sometimes, becksondergaard, house of harlow, naterra, leenoy, the French girl, see you soon, …). Camille and Eugénie, creators and cousins, had a common desire: a small felted and refined fashion boutique, in the heart of a “Bohemian Chic” neighborhood. “Les Voltigeuses” are about twenty designers including Karl Marc John, Vero Moda, Scarlet Roos, Marie Sixtine and other Lili Cabas, Adéli Paris or By Joe for accessories, at affordable prices and selected with finesse. For Dandy chic men ! Franco-Swedish based in Paris, Alexandre Chapellier decides at 30 years to put an end to his Yuppie youth career to launch in 2011 its brand of luxury accessories (famous for their bow ties). Passionate about fashion since always, he abandons Overnight Stock Exchange Prices for the thread of the fabrics.